COMPATIBLITY – This screen replacement is ONLY compatible with iPhone 6 Plus ,Model A1522 , A1524 and A1593. It cannot work with iPhone 6S Plus or other iPhone model. For your convenience, please confirm your iPhone model by searching “How to identify iPhone model” online before you place an order. 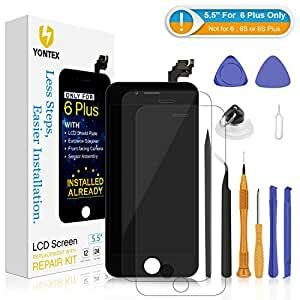 If you need other iphone model screen replacement such as iPhone 6S Plus, please search “YONTEX iPhone 6S Plus screen replacement” on Amazon.